The need of appreciation or affirmation is one the basic (emotional) needs of a person. We do not outgrow it. Appreciation are like kind words or thank you's that lift the spirit. It also encourages the other person to do good so he can receive more of those sweet words. - "thank you for being a co-author. blogging is already 50% done with you." - "you never fail to amaze me how effortless you write your articles." - "I appreciate having you as the serious part of this article and have given me the free will to write whatever I want!" You can appreciate your partner by saying "you look great today!" or "congratulations on your achievement" or "thank you for helping me with the chores today". Simple words can go a long way. We would want to receive it for ourselves as well. - "had a taste of your cooking (boiled beef) and you nailed it! Yummy!" - "and you already know it but again and again, I can't help but say how beautiful you are inside and out." I love it when my husband praises me for a job well done or just being pretty anytime of the day. He loves it when I praise him for the efforts he does for his career. The best thing about appreciation is that it doesn't cost anything. Very well said. It doesn't cost you anything and everything to gain. Especially if your partner's love language is "words of affirmation." Give your partner a hug from the back and say, "thank you for being such an amazing partner (convince yourself that she is!)" or get creative like appreciating your partner in a blog post like how I am appreciating my lovely wife right now as my co-author! If it does not come naturally from you, do a lot of observations. Praise any little thing that your partner does - helping you with the chores, getting up early, putting his dirty clothes in the hamper. You can always find at least one thing to praise him for. One book I have read jokingly said, if you cannot find anything to say, really, tell him "thank you for taking a bath today". Not everyone does that. As the book of Proverbs says, Kind words are like honey, sweet to the taste and good for the heart. When your spouse's love language is words of affirmation, every word you say to him/her goes deep straight to the heart. Make sure it is sweet and full of appreciation and it is guaranteed you just made your spouse's day! Other love languages: acts of service, receiving gifts, physical touch and quality time. 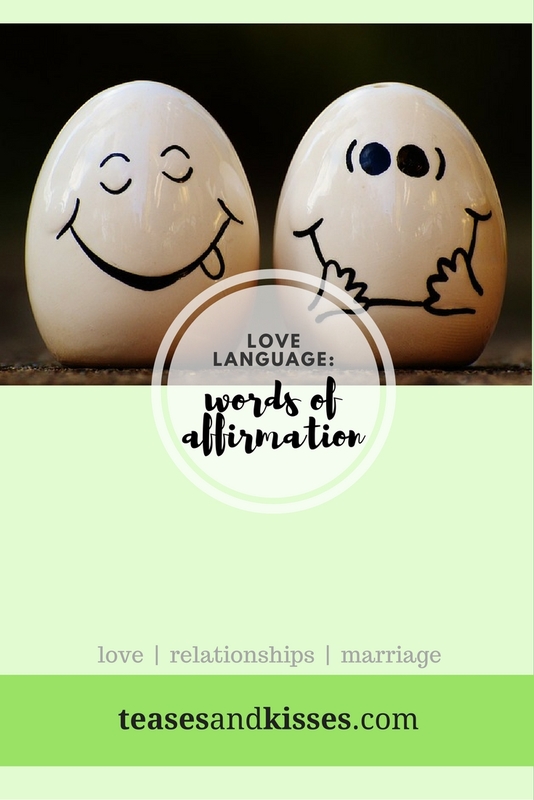 Discover your love language now! TnK tip: if words of appreciation is good for the heart, then hurtful words will surely tear down their hearts. It may lead to grudges or depression with your tongue as the weapon. Be careful with your words.